Transportation Bill Dies in Favor of "Dummy Bill"
Sen. Willie Simmons Presents Bill To Senate Finance Committee. A plan to improve Mississippi’s roads and bridges by raising the state gas tax and vehicle registration fees is effectively dead in committee. But other measures to improve the state’s roads and bridges are making their way through the Senate. S.B. 2859 calls for an eight percent increase in the state gas tax, as well as increases in vehicle registration and other user fees. 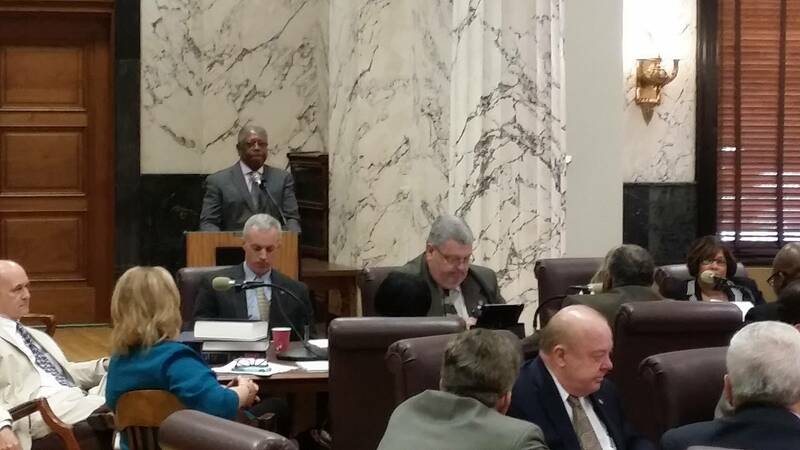 Senate Transportation and Highways Chair Willie Simmons of Cleveland presented the measure to the committee Monday. But less than 24 hours after the introduction, Simmons effectively killed it by refusing to take it up. Simmons says he wasn’t able to garner enough support from fellow lawmakers. Efforts to improve the state’s roads and bridges are not over. Simmons was able to send what’s called a dummy bill to the Senate Finance Committee. That’s a bill that serves as a placeholder until another tax or bonding plan can be created. Senate Finance Committee Chair, Republican Joey Fillingane of Sumrall says the placeholder gives lawmakers the ability to discuss alternative plans. However, the dummy bill is already stirring-up controversy. Nearly half of the Finance Committee voted against it, objecting to not being able to vote on a specific plan. Furthermore, if the dummy bill passes both the House and Senate, lawmakers will likely not know what the measure entails until the very end of the session when there is little to no time to debate or make changes.